XNOISE is a media player for Gtk+ with a slick GUI, great speed and lots of features. Unlike Rhythmbox, Banshee or itunes, Xnoise uses a tracklist centric design. The tracklist is a list of video or music tracks that are played one by one without being removed (right side of window). This gives you the possibility to queue any track in any order, regardless if they are on the same album. Tracks or groups of tracks can be reordered at any time via drag and drop. The media browser (left side of the window) contains all available media in a hierarchical tree structure of the available metadata. 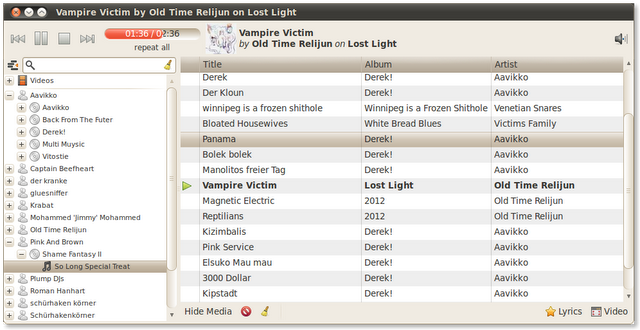 It is easy to find a single track, artist or album by using this tree structure or by just entering a search term. From the media browser, single or multiple tracks, streams, albums, artists or videos can be dragged into the tracklist to every position. Within the playing track, it's possible to jump to any position by clicking the position bar or by scrolling on it. Xnoise can play every kind of audio/video data that gstreamer can handle.